Time Inc. looked around for a buyer and finding none, declared that the new owner would be "You"! How's that for a kick in the teeth. You have a historically important media brand, and no one wants to buy you. Racing and Time Magazine should have a lot in common - they've been attacked by new outlets, they're old, etc - but they really don't. Racing's environment is enhanced because of things like i) Pennsylvania looks at taxing online gaming so it never really has a chance and ii ) since being regulated, DFS, which is being taxed quite hard, is bad - I looked at the $300k MLB game today and the takeout is a massive 17.5%. This is about double what it was in the free market. If the Huffington Post or Drudge were taxed at a high rate, or told they have to only run in 24 states, or told what advertising they could or could not run, or legislated that they had to be behind a paywall, while Time is left to its own devices, Time would be worth something. While Time can't sell itself, and online gaming and DFS are being squeezed, racing happily chugs along. Racing's value lies in data (which it owns), legislation edges (where they are protected), and their regulatory capture. The sad part of that matrix is, the sport is not doing much with it. Losing 1% or 2% of handle per year is considered growth. Sitting on a data haul with no innovation is considered a business strategy. With the protection and edge the sport has been afforded, the lack of growth - like the wordsmith the Donald likes to say - is, in my view, "a disaster." Time Magazine is gone. Most things like Time Magazine are gone, and they're never coming back. Racing on the other hand has ridiculous potential. I just don't think the people in power realize how much. As you all know, the buzz horse for this year's Kentucky Derby is none other than McCraken. His works are "amazing", he cools out "like a good horse should", he looks "shiny like a seal", his baths are "Orb-like". As well, there are numerous rumours surrounding the horse, and his super-human ability. He has captured the imagination of everyone; even curmudgeonly turf writers like Marcus Hersh. With that, after this morning's jog ("perfect") McCraken met the press for the very first time. Here's a summary. "I know y'all have wanted to talk to McCraken, so today McCraken speaks," said McCraken. "Go.... you right there." McCraken motioned his glistening hoof to the DRF's Marty McGee. "How are you feeling? You look good, you look strong, you look formidable. Are my eyes deceiving me? Or are you really this good?" "No Marty, your eyes are the windows to McCraken's soul, and McCraken's soul is strong," said McCraken. "I've been doing what I need to do, working out like Wilksy asks, cleaning out the feed tub. After that McCraken heads right to bed, and sleeps like a small baby." "Follow up. I saw on twitter you worked the other day and cleaned out your feed tub, then you went and cleaned out Classic Empire's feed tub. Was this a form of intimidation?" "McCraken doesn't intimidate. That's starting something, and McCraken only finishes. McCraken did walk by Empire's stall the other day, and he did eat his food. It wasn't intimidation, it was McCraken being hungry." "Why do you talk about yourself in the third person?" asked Joe Drape of the New York Times. "McCraken talks about himself in the 4th person." said McCraken. Drape, and others, looked confused. Andy Serling walked in and said "Holy crap, a talking horse". "Jennie Rees here. McCraken, there's been a lot of talk about revenue sharing. Churchill Downs takes most of the betting money on the Derby, with little going back to the athletes. You've been vocal, asking for more of a revenue share. Do you think it's your place? Do you fear a backlash from the executives?" "If McCraken doesn't show up in the starting gate revenues will plummet, people won't show up, a lot of people will be betting Golden Gate, or Mountaineer instead. As for a backlash, McCraken doesn't care." "What if they give you the one hole? ", Rees queried. "They tell me no horse has won from there, but those horses weren't McCraken." "Is there any horse that scares you when you are watching them on the track?" asked the DRF's Marcus Hersh. "No. but I do see some and feel sorry for them. Like those Pletcher horses - I think I saw, what, six or eight of them. Monogrammed saddles with fancy "TAP" letters? If you have to wear your team name on a shirt, no one knows who you are. I go out naked, and everyone knows it's McCraken." "There's been a lot of rumors you've been sneaking out at night and partying a little, y'know, with some of the ladies," asked the Cummings Report's Ray Paulick. "My agent Sid Fernando told me not to partake in any of that. He says 'wait for the stud deal McCraken'. I listen to my agent, unlike some of these other horses. And by the way you look like Kevin Bacon," said McCraken. "Dave Litfin here. McCraken, I heard a story last week that you were bit by a poisonous spider, but the spider was the one who died, and you went out, worked in 35.2 and came back and cleaned out your feed tub. This seems like a ridiculous story. Is it true?" "No, it's not. Hyperbole follows McCraken. It was not a spider, it was a cobra. He bit me, I shook it off, he was in pain for awhile and died. I then went and worked in 57 for 5 furlongs, not three furlongs. But yes, I did clean out my feed tub." said McCraken. "Wow, was your trainer worried?" "He was. He even made one of my vets take a blood to make sure all was well." "It came back 'titanium'," said McCraken. "Ok. McCraken wants to leave now. This has grown tiresome. I wish you all well with your writing jobs, and we'll see you in the winners circle next Saturday. By the way, you press folks will be watching the race from the finish line this year. McCraken asked the corporate types to move you back there; where you belong. McCraken loves the press, and those CDI suits are scared of McCraken." Keep it tuned right here for more from the PTP Blog as we get closer to the Derby. Have a great Thursday. This is pretty incredible. 80 million. This is a store, not a social networking site like Snapface, as the great Bill Belichick likes to wax poetic about. The Amazon business model is complex, yet simple. This is exactly, in my view, what racing's ADW model should have always been. Right down to the letter. But it's not. Not even close. Think about what "ADW Prime" delivers to a customer. At Woodbine's ADW, they won't even pay you track odds on all simulcasted tracks, they add a surcharge. Tell me, how would Amazon have 80 million people wanting to buy products if the price of them is 20% or 30% higher than at the store on Main Street? When racing lands a new customer it needs to think more like an internet company, and less like a bricks and mortar everything to everyone company. That customer needs to be cultivated, helped along, and encouraged to play the sport, hopefully each day. Instead of asking more from ADW companies for purses, racing should probably be asking for less, but demanding new investment into new products. With a revenue share of any new business, of course. I read a brief overview of a book on the 2016 Clinton campaign recently. One paragraph struck me. Stumped for months by how to explain why their candidate wanted to be president, Clinton staffers began toying with the idea of seeing how "Because it's her turn" might fly as a public rallying cry. The book, (from mainly anonymous sources, but is not really being disputed too much) goes on to talk about how data was not used properly, how Mr. Sanders campaign was simply a bump in the road and not any sort of movement they needed to react to, how signals were noise, and how slow the reaction time was to what was really going on. It's easy to stick the knife in when someone, or some team, or some horse loses. We live in a social media world where blame has to be assigned, and we have to club that person or institution into submission 140 characters at a time. But I think that one line - "because it's her turn" - means quite a bit. When a business, or person, or whatever, expects something, or believes it is theirs, it can create a culture. In racing this is, in my view, very prevalent. Whenever a new competitor to racing surfaces, racing doesn't draft a plan to compete better, it expects to be given a piece of it. When the handle numbers go down, that signal is not a rallying cry to change course; racing expects slices of the pie to be changed. Through whoever today's villain is - lately it has been the bad ADW people - purses will get more because it's owed and this is the way it is. When California was raising takeout (one of life's great mysteries - how it takes only months to raise takeouts state wide in California, but years to pass 3rd party lasix) it was all about what is expected, and owed. The takeout hike would jump purses to $200 million per year, fields will be full and all will be well. That the data (even rudimentary data) said this wouldn't happen didn't matter. "We're owed this." In Ontario, where there were signals for years that slots were going away, no one believed it. In fact, the few people who did believe it tried to convince participants to give up 5% of purses to spur betting demand for when the day came. It failed to pass. Now, purses are about one third of what they once were. Strangely, many of these same people still believe they'll be made whole, because they're owed. Racing will be protected because competition will be taken care of by someone else. Racing is owned money from slots and poker and sports betting because it was once the only game in town, now it isn't. The laws of gambling supply and demand don't apply, because they've never applied. These things are all dangerous, but they're still the staples of the horse racing business; a business that believes it's always been their turn. I was delving into different forms of betting in sports recently, and came across another item. Esports betting is growing like a bad weed, with some expecting handles north of $20B in a few years. With that growth, the demand for data is huge, and it's in the very nascent stages. “Esports is quite unique,” says James Watson, head of esports at Betradar. “The data is available from the games themselves, of course. But it isn’t necessarily available in real-time. How the player experiences the products firsthand will settle the arguments, eventually. Watson makes the point that the esports audience doesn’t suffer fools gladly. There are several companies in the mix, fighting to innovate in the space. The esports data algo and various deliverables are also not being built for a present market, they're being built to create a market. 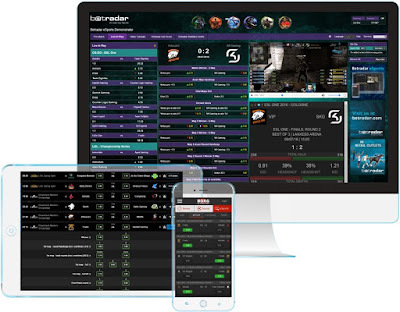 Real time betting is where it's at, and the growth of their enterprise will likely hinge on servicing this potential market. The amount of data esports generates is vast. Building the models that can handle these data flows – and make use of them in the context of potential in-play betting opportunities – is a mammoth job. Meanwhile, in racing, we've got issues related to older systems and infrastructure, monopolies on data, and a real inconsistency problem when it comes to basic things like the timing of races and run ups. Have you tried to bet a maiden race at Delta or Evangeline lately? There's a good chance the horse will not even have his or her recent works listed. Basic, basic stuff. Racing too depends on data, and there's a market thirsting for it. Racing could also be one of the best, in my view, real-time betting games assembled. Racing data could probably create brand new betting products for a newer world, too. It just fails to happen. The e-sports betting community doesn't "suffer fools gladly" and this is a customer growth focus. Racing should pay heed to that advice. I believe they're leaving a lot of money on the table by not letting a data-rich betting game reach its potential. I marvel sometimes how we get so stuck in a bog in racing. Racing is about rich people and brands, where old men gamble and women watch them (while wearing a nice hat); where the young fellow at the end of the grandstand is boozing on 50 cent beer. Targeting them involves that stereotype. It's the way it is. Instead, others take a different path. I had to do some research recently and learned that the video gaming top-line demo in the US is primarily male, and young. I guess that should be no secret. So, a marketer (a terrible title for today's profession, but we'll use it) should, according to racing, act accordingly. This is an open and shut case, no need to call Matlock. But it's not the way things work in today's world. That's why others use cohort analysis, subsets of subsets, and take advantage of the amazing tools data and the web affords. When you do that, doors open. Adult women have recently unseated teenage boys as the largest video game—playing demographic, according to the Entertainment Software Association. YouTube trends reflect this: Viewership among women has doubled year over year, and women over the age of 25 are the fastest-growing demographic for gaming content. two in five 18—34-year-old viewers of StyleHaul, a network of female-focused beauty and fashion channels, also watch channels on Machinima, one of the biggest gaming networks. So, by targeting males under 25 only, we are ignoring the fastest growing demo in gaming. Not only that, women over 25 (or men) have more disposable income than those younger, so we're ignoring higher incomes and hurting ROAS, which is the main KPI. The videos we use to promote gaming, should probably be longer and more detailed if we're targeting over 25 women. If over 25 year old women are sharing these videos more, why is that happening? What can we learn? Social currency is dollars and cents, it's not a small part of ROI, and it needs to be maximized. Style and beauty mixes with gaming? Apparently so, so let's do a banner ad campaign on those sites, with a 25-34 demo and see what happens in terms of cross promotion. And of course, at the end of the test we'll find out if we're right or all wet. It's probably easier to get folks to the track with jewelry, hats, and whatever else, based on how we pigeon-hole, or based on what we think we know. But, honestly, I think it's really short-sighted, and it's one of the more maddening parts of this sports' marketing and outreach efforts. Speaking of racing and markets, here's a tome on the state of gambling - DFS, esports and possible upcoming legislation - and what racing should or could be doing to harness it. Let me know what you think. Have a nice weekend everyone. We have a nice base with slot money, and table games might be coming in, so I'd say the future looks good. We hope to have poker rooms approved soon. Our Big Fish unit has been really good. Sometimes we wonder what business the horse racing business is in. “Our trick from a horse racing standpoint is to make sure it doesn’t cannibalize what we’re doing. The influx of lotteries and internet gaming and offshore gaming hurts us significantly today. The sport of horse racing has been cannibalized by the lack of enforcement, shall we say, of offshore wagering and the influx of corner store gaming and pro-line gaming. None of that existed 20 years ago. Single-game sports betting, it goes on today and everyone appreciates that and I think it’s a game-changer. The important thing for the horse racing industry is we be part of it." “A game-changer,” Lawson notes, and one that could go a long way in helping Woodbine complete the vision of boosting the number of visitors to the massive 683-acre plot from the current five-to-six million per year, all the way up to 10-12 million, a number that he hopes is five to 10 years away. Woodbine has a *monopoly* on internet horse wagering in Canada. No TVG, no Twinspires, no PTC, no Amwager. A monopoly. If your business had a monopoly on something - say you were the only company that could sell milk to consumers - wouldn't you try to maximize revenues by selling milk? Would you spend your time worrying about selling orange juice, Pepsi or Yoo Hoo? Would you be trying to invite competition - on your property and in your stores, no less - so the sales of your monopoly product decrease? Horse racing in general has zero confidence in their core gambling product. They believe there's no growth, no way forward; that the game is dead, and old, and not savable. Maybe they're right. It is unable to be saved. But I wish they'd learn that the products they're asking for to 'save horse racing '- like sports betting - are flourishing because customers pay 4.5% on each bet, and for hundreds of years have been able to scratch out some profit here and there, to keep them coming back. That the slot machines on the floor, or the electronic poker room downstairs would be the ones who need saving if they jacked the takeout rates to 26%. It appears Woodbine will keep adding surcharges to simulcast races, look for every nickel and every dime from customers, encouraging them to wager offshore, encouraging them to use their bankrolls on sports betting, or poker. Then, when their handle continues to struggle, they'll wistfully wonder why horse racing is so dead. If there's something we learn often - so much so it should not be surprising anymore - politicians really like freedom, except when they don't like freedom. In this week's edition, there are rumblings in the US that the 2011 opinion that allowed states to run and regulate internet gambling is on the way out. "Sessions indicated that as attorney general he would revisit and likely overturn a 2011 opinion by the agency that restored federal gambling law to Congress’s original intent and returned power to regulate intrastate gambling to the states." With lobbying, cronyism, and other isms, this could mean that gambling online, as we know it, will be banned in some form. While the ACLU and true conservative groups complain, racing - outside the large gaming companies, of course - should be happier than Exaggerator in slop. Racing's big edge, for about as long as we remember, has been their monopoly power. Even as it eroded over time, it was given carve-outs with slot machines and other subsidies to help it along. By potentially banning internet gambling, this could be yet another protection, offering a new comparative advantage. Perhaps in a year, poker will shoved offshore, DraftKings will lose some edge (they are already getting taxed so hard I don't think racing should worry about them, though) and new start-ups with new games or technology will be thwarted. Racing, as per usual, won't be touched at all. Consumers will not cheer, and it won't change the way we as racing consumers consume the sport (in fact, it's an excuse to do even worse; see government control in Ontario), but racing should be dialing 1-800 Flowers and sending Jeff Sessions a really nice fruit basket. Classic Empire got some major kudos on twitter this weekend after his win in the Arkansas Derby. I see a very talented horse who could do with some time off and come back later in the year, a la Arrogate. But I've been wrong a hundred million times before. Regardless, I will let him beat me. Oaklawn's handle was up last meet. With field size falling and no turf racing, this is impressive. Keeneland has had a good meet, with good weather, so far. This continues the big track, good handle narrative we've heard for the past year or two. Well, it seems to work that way outside of California anyway. Did you ever bet a horse who raced like a 4-5 shot but had traffic trouble one week and lost. Then the same thing happened the next race? And the next? That horse should be named the Minnesota Wild. No, the best horse doesn't always win the race, and the better hockey team doesn't either. It's always something we need to remember when wagering. Goals are 3-7 across the 3 games. MIN is -5.63 below expected. Have a really nice Monday everyone. Awhile back, Jeff Bezos of Amazon released a shareholder and employee letter from 1997. In it, and much more recently, Bezos describes his company as a "Day One" firm. To him, a day one company is one which is just beginning in its journey, not in the middle, or at the end. "Bezos compares "Day 1" companies — companies that are at the beginning of their potential — with "Day 2" companies. "Day 2 is stasis. Followed by irrelevance. Followed by excruciating, painful decline. Followed by death. And that is why it is always Day 1." 20 years later Amazon.com is still a day one company. "It takes a long time to build sustainable long-term value. It takes a big long-term vision and obsessive focus on the few things that really matter (in Amazon's case, customer satisfaction). It takes a thick skin and the willingness to ignore the screaming and disgust of shareholders looking for a quick score (which, because of the intense competition in the money-management business, means most shareholders)." To not fall into a day two trap, two things need to occur as a part of the culture, that I find particularly relevant to horse racing: i) Customer obsession and ii) a skeptical view of proxies. The first is self-explanatory. Racing doesn't really do that, and frankly, has never really done that. For goodness sakes if you ask them who the customer is, they'll give you three different answers. The second is more interesting, and I think explains a lot of the problems. "This can happen very easily in large organizations. The process becomes the proxy for the result you want. You stop looking at outcomes and just make sure you're doing the process right. It's not that rare to hear a junior leader defend a bad outcome with something like, "Well, we followed the process." I think of this often when bad policy comes down the pipe, it fails (or is a customer nightmare) and the excuses come out. I also think about it when something is proposed that's clearly and concisely detrimental to racing, but people do it anyway. "We followed the right policy, but the weather was bad." "Well, there's nothing we can do. We don't have a process to fix that issue." "I know if we take more money from an ADW the customer will lose and long-term it might turn out badly for handle, but our processes say it's the only way." "Changing the process of Equibase is a non-starter." Perhaps the granddaddy of them all: "When we need more money we raise takeout, because that's our process." It's not about outcomes, it's about the process (or perhaps more apt, defending the process). In horse racing there's tons of purse money, a revenue floor through alternative gaming, a huge edge through the UIEGA (to own a gambling business with a near-monopoly online), amazing data potential, and niche advantages that are too many to count. Despite that, foal crops are down and with 36% of the world's racing purses, North America brings in only 11% of world wide wagering. Racing has reams of untapped potential. It's the quintessential Day One business. Why is it so resistant to act like one? It's kind of geeky, but I've had a lot of fun reading articles since Monday on how airlines set their prices. Of course, there's the overarching easy answer to that question in the capitalist system, devoid of regulation - the market sets them. But with inventories, capacity, hubs, spokes, backwards and forwards linkages and supply chains and myriad other things, the way the market sets prices is pretty interesting. Airlines operate on 1% margins. I suspected it was more than that. They move 900 million passengers a year in the US. To move massive amounts of people at 1% margins, they need to study reams of data, and formulate a plan that makes things work, at the lowest cost possible. Up to 15% of the people traveling miss their flights. Airlines overbook, primarily, because booking 180 people for a 200 person plane (allowing passengers who switch tickets or miss flights would be guaranteed a seat) would result in higher gross ticket prices (from planes traveling with a lot of empty seats). When overbooked with passengers that need moving, credits can be given which are ROI positive to the airlines, in the long-run. 46,000 people were bumped last year, out of those 900 million trips. The next time you and I see a $299 return deal to NYC, or a discount flight with a ticket price lower than a bus fare, or when we get bumped, we at least learned a little about why that happens. So, we have a multi-million dollar business who studies data, looks at the competition, forecasts, tests, experiments and tweaks, to move 900 million people a year, safely, and with as low a price as possible. I bet a lot of people don’t know that when Dan Patch was racing, takeout rates were five per cent. These rates then moved to 10 per cent, and 15 per cent and so on, to where they are today (around 23 per cent blended in harness racing). None of these price hikes were implemented with econometrics, other fancy calculations, with the use of a 1940’s version of Lotus 123, or at the advice of pricing experts. Nor did they have anything to do with supply and demand, which we all know is how prices for hay, trucks and trailers, sandwiches at the track kitchen or just about everything else we buy are set. The rates were hiked because someone (governments, racetracks) wanted more money, and the consumer – with no other gambling games to play – had little choice in the matter. Even when the consumer was speaking — when handle and revenue fell after yet another hike in New York in the late 1940s — the price increases didn’t pause. Racing set prices on a phantom number, without any data. And the prices they set as a monopoly are being used as benchmarks to set them today. Remember classic lines like, 'when looking at other takeout rates, we have room to raise them and be competitive', when they raised juice in California? Competitive to what, a made-up number? While the news cycle is dominated by a black swan, where one customer did something 45,999 didn't the last year, the pricing system done by airlines in near-perfect competition seems to be working as prescribed. Why? Because they set prices by study, experimentation, field tests and everything you're supposed to. Racing might want to try it someday. Have a nice Wednesday everyone. Harvard Business Review posted what I thought was a good business article some time ago. It focused on adaptability. In a nutshell, it believes that in the inter-connected world, companies that adapt quickly is the new competitive advantage. Adaptation, according to the authors, is built on four pillars: Reading a signal, experimenting, managing the morass of intra-company and industry framework, and mobilizing the new strategy that comes from it. Today, these four things have to happen very quickly. One line caught my eye: "Perhaps most important, they have learned to unlock their greatest resources—the people who work for them." Yesterday (and yes I realize this has been beaten to death) United booted that fellow off the aircraft and is in a heap of trouble. It probably could've been easily avoided. Employees are empowered to implement policy, not think on their feet, or use game theory. In fact, in a lot of large companies, employees thinking on their feet is discouraged (especially in litigious countries, like the US). According to corporate policy (or legislated, depending on what country you're in) the airline can go up to $1,350 for cash outlays for 4+ hour delays, but much more with flight credits (because the marginal cost of a flight half full approaches zero). For long stays it's even more. When an enterprising employee is empowered, he or she could auction off thousands of dollars of flight credits for a seat; in this case to 150 or more passengers. Someone(s) will take you up on it, and it might even be turned into a customer service win. Instead, hamstrung, he or she delivered customer service horror, and a brand hit. This lack of empowerment that a lot of folks talk about really hits home in racing to me. They shall remain nameless, but I've talked to front-line or mid-management employees in racing who understand gambling quite well. They want to read signals, experiment, implement, based on their knowledge of what's happening in the trenches. I guarantee there were people at Santa Anita who cringed when the TOC and CHRB were upping the juice. I am sure there were people at Twinspires who look at data, see what rewards do, see what winning more money does to their customer base in terms of betting volume, who wondered why Churchill was raising the rake. We can use copious examples throughout racing history, with its numerous policy violations. They unfortunately aren't empowered to do anything. They might read a signal and bring it somewhere. There may be the experimentation phase, allowed by a senior manager. Then, even if it works, it hits the c-suite, and the c-suite looks at the third pillar - the morass of stakeholders - and it dies. Racing employees who understand and want to do something are United flight attendants who aren't allowed to go over a set amount for a cash credit; a credit to potentially thwart a multi-million dollar company problem. As someone who chats with horseplayers and customers often (and am unapologetically biased towards them) I tend to hear this : "People are so dumb in this sport. No one understands us"
I think there are scores of people who understand customer issues. Scores. But they aren't empowered to do anything about it. United versus Churchill, Who's Worse? So, in one corner we have United Airlines. We all heard about that today - they overbooked a flight, offered the usual bonus on the booking (in this case, they went up to $800) to get someone to leave the plane, and when no one took them up on it, they had the cops forcibly remove a dude from his seat. Overbooking, as a rule, is something often done, accepted, and not without reason. It's economically sound. But, as they say, the cover up is worse than the crime. Man, it's worth typing again, that's some bad mojo. In another corner, we have the Churchill Downs pick 6. In this instance, one lucky ticket holder was poised for a chance at a $750,000 score on a 20-1 shot in the last leg of a jackpot pick 6. The last leg was cancelled after a brief delay due to the weather. Snooze you lose Mr. Customer. Don't measure the drapes! This could be described as economically sound as well, because if a pick 6 carries over, the track makes mucho moola with the next carryover, and the next and the next. It's some serious scratch. So, the big question: Who is worse in this customer service tete a tete of evil? If we are looking from a customer service perspective, they both get some bad marks. It's like trying to decide if Waterworld was worse than the last Nicholas Cage movie. Economically, though, we can explore this a little further. If you or I overbook, we are offered cold hard cash, or flight credits. I got over $2,000 once and I gladly sat down and waited for my next flight (I played Aqueduct while waiting and lost $500 of it, but what else is new). A decent rule of thumb - you get paid 400% what your ticket is worth. So, your inconvenience has a number. For Churchill Downs, this bettor didn't get any utility; unless he masochistically got some enjoyment from getting the shaft. What would Churchill have to do for it to equate to what United or other airlines do? Well, if the player had a 5% chance to hit for $750,000, CDI would have had to offer the man or woman a chance at winning 4 times that amount, or give him or her 4 times the chance to hit $750,000. In effect, they'd let the ticket holder play roulette, where landing on 20% of the numbers earn them $750,000, or 5% of the numbers earn them $3,000,000. That's pretty fair. In fact, I'd hope for rain, kinda like I hope getting kicked off a plane. So, in terms of expected value, we may conclude United is Goldfinger and Churchill is the Death Star. But, where this gets more interesting - we can probably take points against United for being boneheads (they went to $800, they just had to keep going up by a Benjamin until someone said yes .... $1,000 should've done it). And again, the poor sap who had his chances at a life changing score at Churchill didn't get forcibly removed from his bedroom in his underwear by baton wielding coppers. I think it's fair we call it a tie. Have a nice Monday everyone! The Masters begins tomorrow, but for those in the press pool it began earlier this week, because, for them, something changed. Augusta National invested millions in a state of the art, brand new press room and restaurant for the world wide reporters and commentators covering the event. The Masters is an older event, and they've always catered to the press. In fact, it is scheduled in early April because Augusta National wanted to accommodate the press; the press who were driving back to east coast cities from spring training. There's definitely been a relationship. Meanwhile, in horse racing, we all remember Churchill Downs, back in 2013, moving the press area from the finish line. It's tough to have a strong opinion that Churchill Downs was "wrong", because the world has changed. Reporting on an event that anyone can watch, via dozens of mediums, on phones, tablets, TV's; on youtube, or tweeted in gifs, is today's world. The print press is being decimated. But, it is interesting to me. Augusta National's brand is about the history of the event, and always has been. It's who they are. They, through things like the new media center, embrace that and spend money on that tradition. They're not about wasting money, so they certainly feel the long-term health of the event is helped by this added cost. Racing - another traditional game - doesn't seem to have that same vision.